Dr. William Meadows (center) of the Kiowa Tribe of Oklahoma demonstrates the Plains Indian Hand Game at Missouri State University. 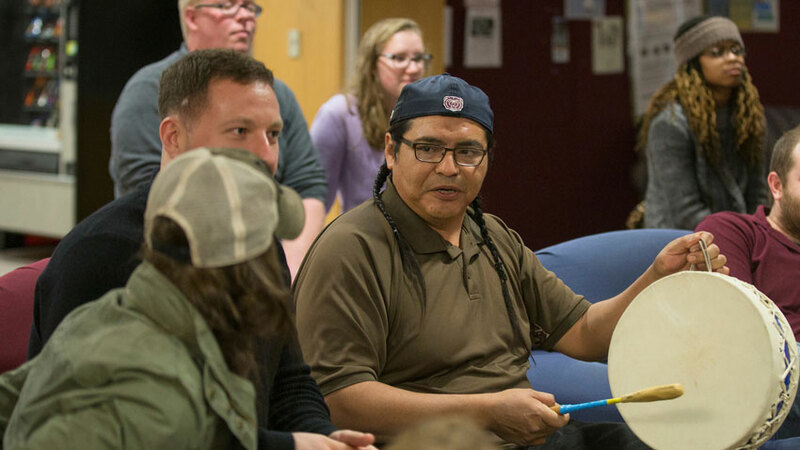 In past years, Native and Indigenous Heritage Month at Missouri State University was called “Native American Heritage Month.” Missouri State changed it this year to incorporate tribes and nations outside of Native Americans and celebrate the groups more holistically. Events scheduled in November will highlight communities and histories that are not usually included in educational curriculums and affirm these identities. Sponsored by multicultural programs, the events are free and open to the public. The month’s highlighted event is the Native and Indigenous Heritage Month Banquet at 5 p.m. Nov. 17 in Plaster Student Union Ballroom West. It will include samplings from traditional native and indigenous foods, and a cultural performance by the native and indigenous group, “Beyond the Circle Dancers.” RSVP required. A Night of Storytelling, Mary Jean Price Walls Multicultural Resource Center Annex, 4 p.m. Learn about native and indigenous history through storytelling. Free food will be provided. Documentary and Dialogue: Native and Indigenous Communities, Mary Jean Price Walls Multicultural Resource Center Annex, 1 p.m. The event features a documentary screening on native and indigenous communities followed by a discussion to promote healthy critical discourse. Craft Lunch Hour, Mary Jean Price Walls Multicultural Resource Center Annex, 12 p.m. Learn about native and indigenous history while making crafts. Free food will be provided. For more information, contact Garcia-Pusateri at 417-836-8921.